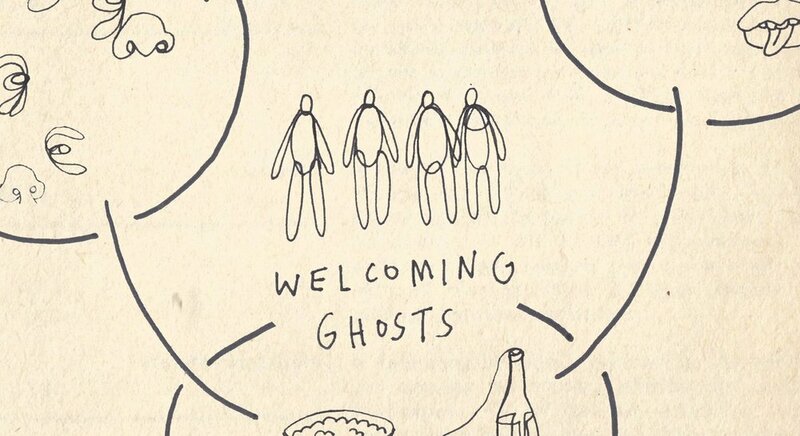 Welcoming Ghosts illustration by Joy Miessi. Taking the form of a monthly working group, Costellations has explored different methods and approaches to artistic reserch and community-oriented practice through a series of workshops. Welcoming Ghosts invited participants to Join the Constellations group for an open workshop exploring notions of heritage, inheritance and cultural identity in relation to community building and group dynamics. Drawing on a number of texts and excerpts from artist's films and videos, Constellations led a series of activities that focus on alternative forms of communication, pedagogy, and knowledge production. Using the workshop as a space to share experiences, difficulties and ideas around individual and collective sense of home, the workshop explored the changing notion of 'Home' for migrants communities in London through the creation of a collaborative block printed textile piece. The Complete Jessy Cohen Museum is a museum of a neighbourhood as told by its inhabitants. This was a six months creative research process, done in collaboration with several groups of residents at Jessy Cohen neighbourhood in Holon, Israel. An experimental collage workshop for young people and their families. We've used found images to develop new realities beyond the imaginable. Participants were encouraged think of a question that begins with "What if...?" and find answers to their question through the process of the work. A year - long residency at Tate Modern and Tate Britain, delivering weekly workshops for visiting school groups. The workshops combined an exploration of the museum’s collection through the prism of my own practice as well as the participants’ interests and curiosities. Using sculpture, drawing and performances the workshops provided a space for playful and thoughtful engagements with art and art-making. 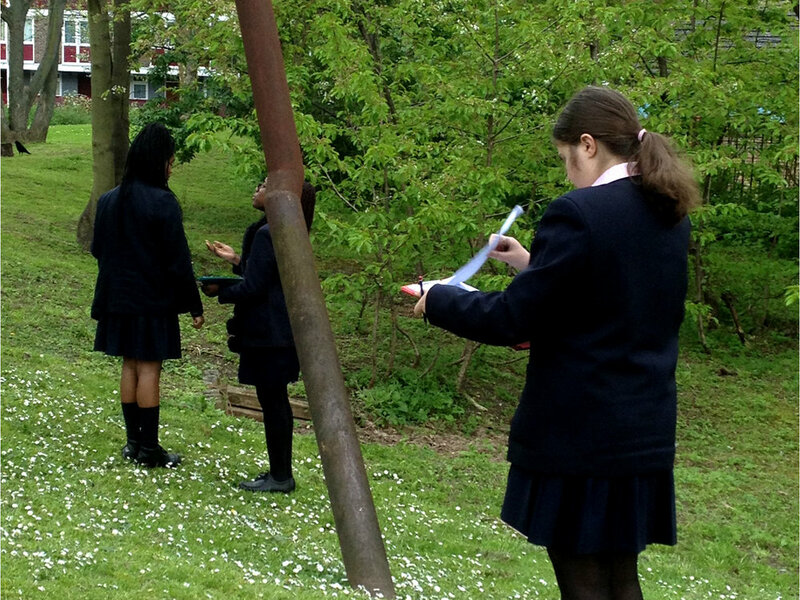 A day long exploration of New Cross with year 10 students from Haberdasher Askes school. A series of mapping exercises inspired each student to develop their map of the area by considering the visual, emotional and social characters of a place. The Utopias workshop challenged year 10 students to re-imagine their city as a futuristic utopian site. Drawing inspiration from both CI-Fi films and Russian constructivism the student used the language of geometric abstraction to create their own imageniative architectural cityscapes. Hotel Elephant Gallery with the Globe Academy. The after school art club was initiated due to a lack of support for young people in the area to continue pursuing their studies in art. It was designed to provide them with a platform in which they could develop their ideas outside of the school's curriculum and experiment with contemporary and collective approaches to art making. In a Series of workshops the group explored the area of Elephant and Castle by looking into the patterns and textures that made up the neighbourhood. They investigated the public space through the contrasting elements of urban and natural environments, discussing issues such as industrialisation, labour and gentrification and reflecting on the influences these have on the daily lives of the neighbourhood’s residents. Redefining Beauty comprised of a series of devised workshops That took place at Lewisham Young Women's Resource Project with a group of young girls. Taking its inspiration from Naomi Wolf's The Beauty Myth, each workshop examined the ways in which women's representation in the media effect individual and collective notions of beauty and define our relationships to our bodies.